As usual Royal Mail will issue a set of 6 Christmas stamps, a miniature sheet and a Smilers Sheet. This year’s Christmas stamps feature traditional pantomimes (details below). The two 2007 Madonna stamps will be reissued this year to provide an alternative Christian image. 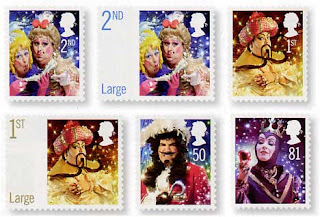 The Pantomimes set is issued as a set of 6 self-adhesive stamps, and a miniature sheet with conventional gum. Also available are booklets of 12 1st and 12 2nd class stamps, presentation packs, stamp cards, first day covers and a Smilers sheet.